China plays an oversized role in the world’s economy. It is the world’s largest energy consumer, and the world’s largest energy producer. Recently, it has become the world’s largest importer of both oil and of coal. In some sense, China is the world’s largest economy. Usually we see China referred to as the world’s second largest economy, based on GDP converted to US dollars. Economists use an approach called GDP (PPP) (where PPP is Purchasing Power Parity) when computing world GDP growth. When this approach is used, China is the world’s largest economy. The United States is second largest, and India is third. Figure 1. World’s largest economies, based on energy consumption and GDP based on Purchasing Power Parity. 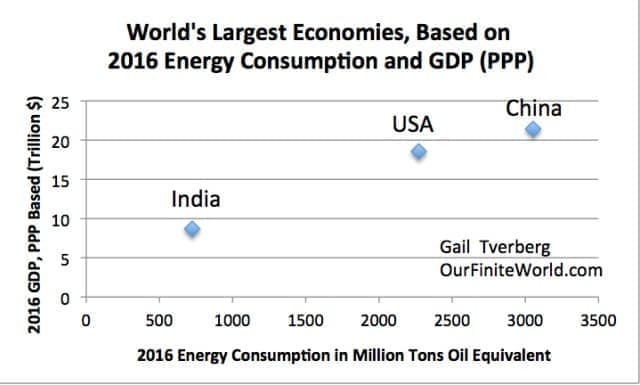 Energy Consumption is from BP Statistical Review of World Energy, 2017; GDP on PPP Basis is from the World Bank. Besides being (in some sense) the world’s largest economy, China is also a country with a very significant amount of debt. The government of China has traditionally somewhat guaranteed the debt of Chinese debtors. There is even a practice of businesses guaranteeing each other’s debt. Thus, it is hard to compare China’s debt to the debt level elsewhere. Some analyses suggest that its debt level is extraordinarily high. Figure 2. 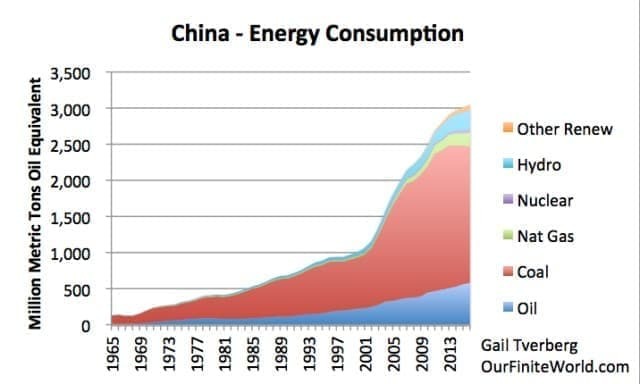 China’s energy consumption, based on data from BP Statistical Review of World Energy, 2017. From Figure 2, it is clear that something very dramatic happened to China’s coal consumption about 2002. China joined the World Trade Organization in December 2001, and immediately afterward, its coal consumption soared. Countries in the OECD, whether they had signed the 1997 Kyoto Protocol or not, suddenly became interested in reducing their own greenhouse gas emissions. If they could outsource manufacturing to China, they would be able to reduce their reported CO2 emissions. - The goods being manufactured in China would be cheaper, allowing Americans, Europeans, and Japanese to buy more goods. If more “stuff” makes people happy, citizens should be happier. - Businesses would suddenly have a new market in China. Perhaps the people of China would start buying goods made elsewhere. Of course, a major downside of moving jobs to China and other Asian nations was the likelihood of fewer jobs elsewhere. Figure 3. US Labor Force Participation Rate, as prepared by Federal Reserve Bank of St. Louis. In the early 2000s, when China started competing actively for jobs, the share of people in the US workforce started shrinking. The drop-off in labor force participation did not level out until mid-2014. This is about when world oil prices began to fall, and, as we will see in the next section, when China’s growth in average wages began to fall. Another downside to moving jobs to China was more CO2 emissions on a worldwide basis, even if emissions remained somewhat lower locally. 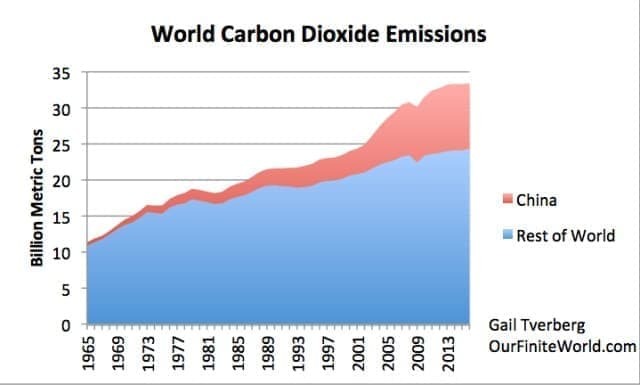 CO2 emissions on imported goods were not “counted against” a country in its CO2 calculations. Figure 4. World carbon dioxide emissions, split between China and Rest of the World, based on BP Statistical Review of World Energy, 2017. At some point, we should not be surprised if countries elsewhere start pushing back against the globalization that allowed China’s rapid growth. In some sense, China has lived in an artificial growth bubble for many years. When this artificial growth bubble ends, it will be much harder for China’s debtors to repay debt with interest. Rising wages are important for making China’s growth possible. With rising wages, workers can increasingly afford the apartments that are being built for them. They can also increasingly afford consumer goods of many kinds, and they can easily repay debts taken out earlier. The catch, however, is that wage growth cannot get ahead of productivity growth, or the price of goods will become too expensive on the world market. If this happens, China will have difficulty selling its goods to others. China’s wage growth seems to have slowed remarkably, starting in 2014. Figure 5. 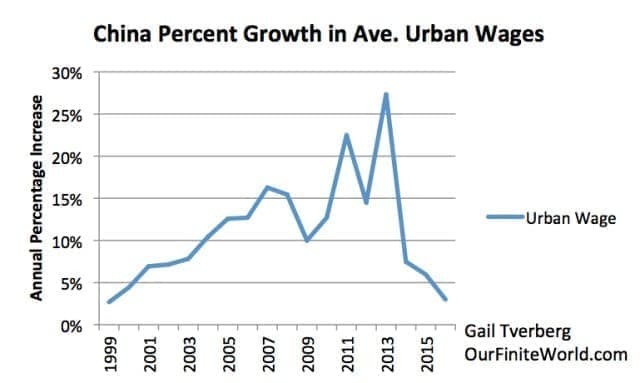 China’s percent growth in average urban wages. Values for 1999 based on China Statistical Yearbook data regarding the number of urban workers and their total wages. The percentage increase for 2016 was estimated based on a Bloomberg Survey. This is when China discovered that its high wage increases were making it uncompetitive with the outside world. Wage growth needed to be reined in. Its growth in productivity was no longer sufficient to support such large wage increases. If we look at the annual growth in total energy consumption and electricity consumption, we see that by 2014 to 2016, their growth had slowed remarkably (Figure 6). Their growth pattern was starting to resemble the slow growth pattern of much of the rest of the world. Energy growth allows an economy to increasingly leverage the labor of its workforce with more energy-powered “tools.” With low energy growth, it should not be surprising if productivity growth lags. With low productivity growth, we can expect low wage growth. Figure 6. China’s growth in consumption of total energy and of electricity based on data from BP Statistical Review of World Energy, 2017. It is possible that the increased rate of electricity consumption in 2016 is related to China’s program of housing migrant workers in unsalable apartments that took place at that time. The fact that these apartments were otherwise unsalable was no doubt influenced by the slowing growth in wages. This decrease in energy consumption most likely occurred because the price of China’s energy mix was becoming increasingly expensive. For one thing, the mix included a growing share of oil, and oil was expensive. The proportion of coal in the mix was falling, and the replacements were more expensive than coal. There was also the issue of the general increase in fossil fuel prices. Affordability is the big issue with respect to how high fossil fuel prices can rise. The issue is not just buying the oil or coal or natural gas itself; it is also being able to afford the goods made with these fuels, such as food, clothing, appliances, and apartments. If wages were depressed in the developed countries because of moving production to China, then rising wages in China (and other similar countries, such as India and the Philippines) must somehow offset this problem, if fossil fuel prices are to remain high enough for extraction to continue. Figures 7 and 8 (below) show that oil, natural gas, and coal prices all started to slide, right about the time China’s urban wages growth began shrinking (shown in Figure 5). Figure 7. 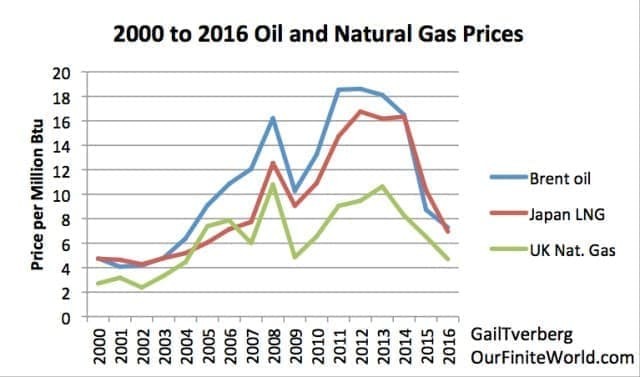 Oil and natural gas prices, based on BP Statistical Review of World Energy data. Figure 8. Coal prices between 2000 and 2016 from BP Statistical Review of World Energy. Chinese coal is China Qinhuangdao spot price and Japanese coal is Japan Steam import cif price, both per ton. The lower recent increases made China’s urban wage growth look more like that of the US and Europe. Thus, in 2014 and later, Chinese urban wages present much less of a “push” on the growth of the world economy than they had previously. Without this push of rising wages, it becomes much harder for the world economy to grow very rapidly, and for it to have a very high inflation rate. There is simply not enough buying power to push prices very high. It might be noted that the average Chinese urban wage increases shown previously in Figure 5 are not inflation adjusted. Thus, in some sense, they include whatever margin is available for inflation in prices as well as the margin that is available for a greater quantity of purchased goods. Because of this, these low wage increases may help explain the recent lack of inflation in much of the world. Quite likely, there are other issues besides China’s urban wage growth affecting world (and local) energy prices, but this factor is probably more important than most people would expect. Can low prices bring about “Peak Coal” and “Peak Oil”? What does a producer do in response to suddenly lower market prices–prices that are too low to encourage more production? This seems to vary, depending on the situation. 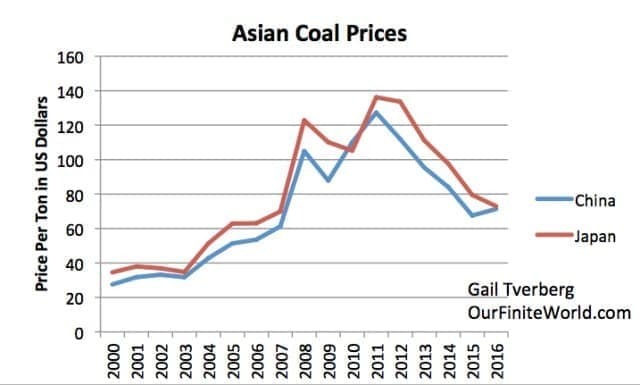 In the case of coal production in China, a decision was made to close many of the coal plants that had suddenly become unprofitable, thanks to lower coal prices. No doubt pollution being caused by these plants entered into this decision, as well. So did the availability of other coal elsewhere (but probably at higher prices), if it is ever needed. The result of this voluntary closure of coal plants in response to low prices caused the drop in coal production shown in Figure 8, below. Figure 9. China’s energy production, based on data from BP Statistical Review of World Energy, 2017. It is my belief that this is precisely the way we should expect peak coal (or peak oil or peak natural gas) to take place. The issue is not that we “run out” of any of these fuels. It is that the coal mines and oil and gas wells become unprofitable because wages do not rise sufficiently to cover the fossil fuels’ higher cost of extraction. We should note that China has also cut back on its oil production, in response to low prices. EIA data shows that China’s 2016 oil production dropped about 6.9 percent compared to 2015. The first seven months of 2017 seems to have dropped by another 4.2 percent. 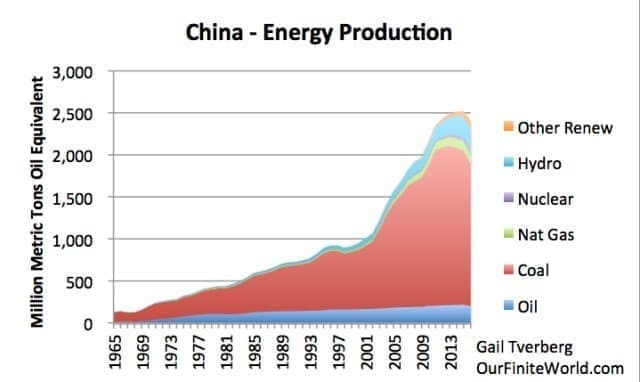 So China’s oil is also showing what we would consider to be a “peak oil” response. The price is too low to make production profitable, so it has decided that it is more cost-effective to import oil from elsewhere. Let me give you my understanding regarding how the Chinese system works. Basically, the system is gradually moving from (1) a system in which the government owns all land and most businesses to (2) a system with considerable individual ownership. Related: Is Saudi Arabia Lying about Its Oil Inventories? Back in the days when the government owned most businesses and all land, farmers farmed the land to which they were assigned. Businesses often provided housing as part of an individual’s “pay package.” These homes typically had a shared outhouse for a bathroom facility. They may or may not have had electricity. There was relatively little debt to the system, because there was little individual ownership. In recent years, especially after joining the World Trade Organization in 2001, there has been a shift to more businesses of the types operated in the West, and to more individual home ownership, with mortgages. The economy acts rather differently than in the West. While the economy is centrally planned in Beijing, quite a bit of the details are left to individual local governments. Local heads of state make decisions that seem to be best based on the issues they are facing. These may or may not match up with what Beijing central planning intended. Historically, Five-Year Plans have provided GDP growth targets to the various lower-level heads of state. The pay and promotions of these local leaders have depended on their ability to meet (or exceed) their GDP goals. These goals did not have any debt limits attached, so local leaders could choose to use as much debt as they wanted. A major consideration of these local leaders was that they also had responsibility for jobs for people in their area. This responsibility further pushed them to aim high in the amount of development they sought. Another related issue is that sales of formerly agricultural land for apartments and other development are a major source of revenue for local governments. Local leaders did not generally have enough tax revenue for programs, without supplementing their tax revenue with funds obtained from selling land for development. This further pushed local leaders to add development, whether it was really needed or not. The very great power of local heads of state and their administrators made these leaders tempting targets for bribery. Entrepreneur had a chance of getting projects approved for development, with a bribe to the right person. There has been a recent drive to eliminate this practice. We have often heard the comment, “A rising tide raises all boats.” When the West decided to discourage local industrialization because of CO2 concerns, it gave a huge push to China’s economy. Almost any project could be successful. In such an environment, local rating agencies could be very generous in their ratings of proposed new bond offerings, because practically any project would be likely to succeed. Furthermore, without many private businesses, there was little history of past defaults. What little experience was available suggested the possibility of few future defaults. Wages had been rising very rapidly, making individual loans easy to repay. What could go wrong? With the central government perceived to be in control, it seemed to make sense for one governmental organization to guarantee the loans of other governmental organizations. Businesses often guaranteed the loans of other businesses as well. In the model of development we are used to in the West, there are feedback loops if too much of anything is built–apartment buildings (sold as condominiums), coal mines, electricity generating capacity, solar panels, steel mills, or whatever else. Apartments. China has had a well-publicized problem of building way too many apartments. In about 2016, this problem seems to have been mostly fixed by local governments providing subsidies to migrant workers so that they can afford to buy homes. Of course, where the local governments get this money, and for how long they can afford to pay these stipends, are open questions. It is also not clear that this arrangement is leading to a much-reduced supply of new homes, because cities need both the revenue from land sales and the jobs resulting from building more units. 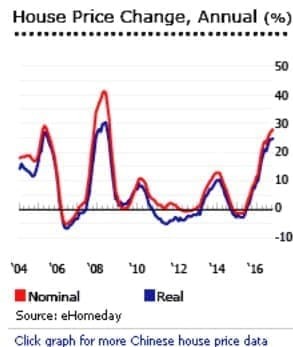 Figure 9 shows one view of the annual increase in Chinese house prices, despite the oversupply problem. If this graph is correct, prices have increased remarkably in 2017, suggesting some type of stimulus has been involved this year to keep the property bubble growing. The size of an apartment a typical worker can now afford is very small, so this endless price run-up must end somewhere. Figure 10. Chinese house price graph from GlobalPropertyGuide.com. Coal-Fired Power Plants. With all of the problems that China has with pollution, a person might expect that China would stop building coal-fired power plants. Instead, the solution of local governments has been to build additional power plants that are more efficient and less polluting. The result is significant overcapacity, in total. A May 2017 article says that because of this overcapacity problem, Beijing is forcing every coal-fired power plant to run at the same utilization rate, which is approximately 47.7 percent of total capacity. A Bloomberg New Energy Finance article estimates that at year-end 2016, the “national power oversupply” was 35 percent, considering all types of generation together. (This is likely an overestimate; the authors did not consider the flexibility of generation.) Related: Is OPEC Deal Compliance About To Crash? Beijing is aware of the overcapacity problem, and is cancelling or delaying a considerable share of coal-fired capacity that is in the pipeline. The plan is to limit total coal-fired capacity to 1,100 gigawatts in 2020. China’s current coal-fired generating capacity seems to be 943 gigawatts, suggesting that as much as a 16 percent increase could still be added by 2020, even with planned cutbacks. 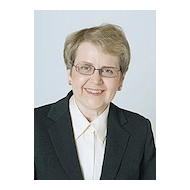 It is not clear what happens to the loans associated with all of the capacity that has been cancelled or delayed. Do these loans default? If “normal” feedbacks of lower prices had been allowed to play out, it is doubtful that such a large amount of overcapacity would have been added. 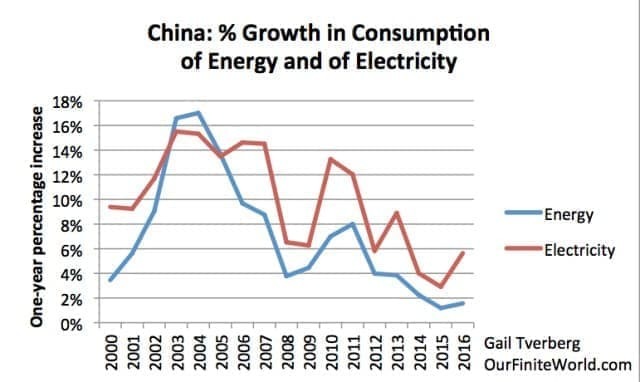 If China’s overall growth rate slows to a level more similar to that of other economies, it will have a huge amount of generation that it doesn’t need. This adds a very large debt risk, it would seem. Wind and Solar. If we believe Darien Ma, author of “The Answer, Comrade, Is Not Blowing in the Wind,” there is less to Beijing’s seeming enthusiasm for renewables than meets the eye. According to Ma, China’s solar industry was built with the idea of having a product that could be exported. It was only in 2013 when Western countries launched trade suits and levied tariffs that China decided to use a substantial number of these devices itself, saving the country from the embarrassment of having many of these producers go bankrupt. How this came about is not entirely certain, but the administrator in charge of wind and solar additions was later fired for accepting bribes, and responsibility for such decisions moved higher up the chain of authority. Figure 11. 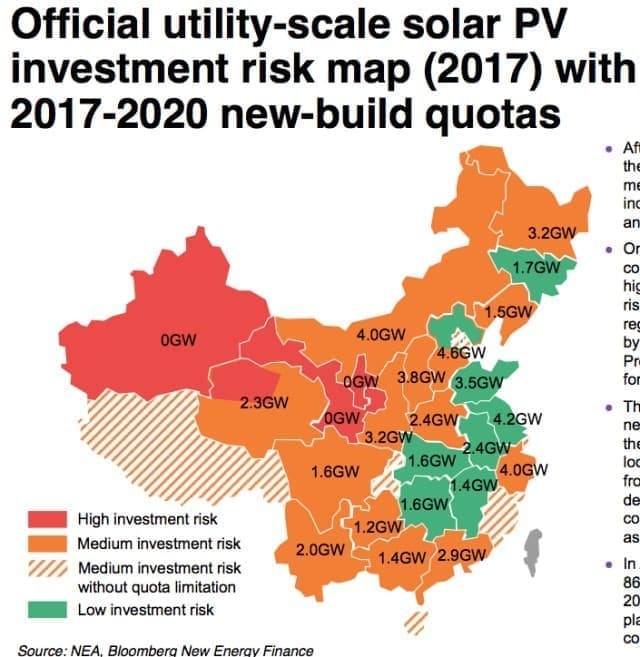 China current view of solar investment risk in China. Chart by Bloomberg New Energy Finance. According to Ma, the Chinese National Energy Administration has figured out that wind and solar are still about 1.5 and 2.5 times more expensive, respectively, than coal-fired power. This fact dampens their enthusiasm for the use of these types of generation. China plans to phase out subsidies for them by 2020, in light of this issue. Ma expects that there will still be some wind and solar in China’s energy mix, but that natural gas will be the real winner in the search for cleaner electricity production. Viewed one way, we are looking at yet another way Chinese officials have avoided closing Chinese businesses because the marketplace did not seek their products. Thus, the usual cycle of bankruptcies, with loan defaults, has not taken place. This issue makes China’s total electricity generating capacity even more excessive, and reduces the profitability of the overall system. We have shown how low wages and low energy prices seem to be connected. When prices are too low, some producers, including China, make a rational decision to cut back on production. This seems to be the true nature of the “Peak Coal” and “Peak Oil” problem. Because China is reacting in a rational way to lower prices, its production is falling. China is already the largest importer of oil and coal. If there is a shortfall elsewhere, China will be affected. We have also given several examples of how the current system has been able to avoid defaults on loans. The issue is that these problems don’t really go away; the get hidden, and get bigger and bigger. At some point, all of the manipulations by government officials cannot hide the problem of way too many apartments, or of way too much electricity generating capacity, or of way too many factories of all kinds. 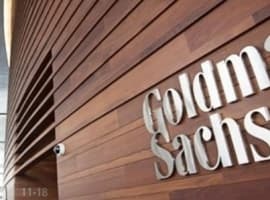 The postponed debt collapse is likely to be much bigger than if market forces had been allowed to bring about earlier bankruptcies and facility closures. Chinese officials are now talking about reining in the growth of debt. There is also discussion by heads of Central Banks about raising interest rates and selling QE securities (something which would also tend to raise interest rates). China will be very vulnerable to rising interest rates, because stresses that have been allowed to build up in the system. For example, many mortgage holders will not be able to afford the new higher monthly payments if rates rise. If interest rates rise, factories will find it even harder to be profitable. Some may reduce staff levels, to try to reach profitability. If this is done, it will tend to push the system toward recession. We likely now are in the lull before the storm. There are many things that could push China toward an energy or debt crisis. China is so big that the rest of the world is likely to also be affected. "the mismatch between prices and wages can be covered for a while by more government spending and by more debt, but eventually, energy prices must fall below the cost of production, at least for some producers." Didn't we just go through that the last three years? Capital spent on exploring for new sources of oil hit an all-time low as a percentage of demand. Go on Google Earth and check out the size of the shallow Russian Arctic continental shelf. That is about half the size of the Lower 48! Notice those 3 big rivers draining that way. I would bet they deposited a lot of organic material up there. 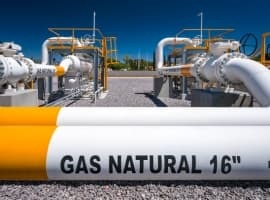 Over tens of millions of years, it could have transformed into a vast amount of natural gas after burial. Much of Siberia was covered by lava during the Siberian traps eruption. Is there oil and gas that got buried under there during the million years of the eruptions? I doubt it, but you never know. Locating it might be a problem though. I wouldn't count on China collapsing anytime soon. The global economy is safe until oil and gas production begins to decline, unless electrification of transportation is well underway when it begins.